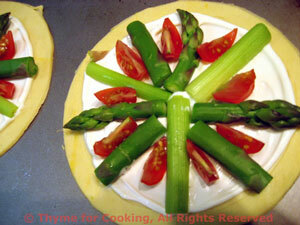 Asparagus Pastry, Thyme for Cooking easy spring starter. Puff pastry makes wonderful 'tarts'. The asparagus and green garlic (or green onion) are blanched quickly first. Then it's just assemble and bake, for an easy but impressive first course. Thaw puff pastry, if needed. Cut out 2 circles, 6" (15cm) in diameter. (Use a bowl as a guide). Lay the cut pastry on a baking sheet. Using a table knife, lightly score a line .5" (1.25cm) inside the edge of the pastry. Trim asparagus to 5" (12.5cm). Reserve ends for another use. Trim green garlic or onion by slicing off root and and removing 1 layer. Trim to 2.5" (6.25cm), using as much green top as possible. Reserve the white ends for another use. 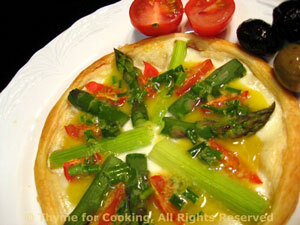 Bring 1 - 2 inches (5cm) of water to a boil in a skillet large enough to hold the asparagus and garlic in one layer. Add the asparagus and blanch for 2 - 4 minutes, depending on thickness. Mine were as thick as my index finger and I did 3 minutes. Remove and refresh in cold water. Blanch green garlic or onions for 2 minutes. Remove and refresh in cold water. Cut the asparagus in half the short way. Slice cherry tomatoes into wedges. Spread cheese on the pastry, out to the scored line. 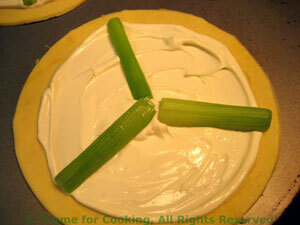 Laying them like the spokes of a wheel, radiating out from the center: put the asparagus tips at third intervals; put the asparagus ends next to the tips; put the green garlic or onion next. Put one tomato wedge in each 'space'. Bake in pre-heated oven at 420F (210C) for 10 - 13 minutes, until sides of pastry have puffed around middle and is golden brown. Remove and put on plates. Drizzle with Vinaigrette and serve. Slowly drizzle in oil, whisking constantly. Add chives, whisk well.